Many of us have worked all year long to meet our healthy New Year’s resolutions. Don’t let tailgates and parties get in the way of your goals. 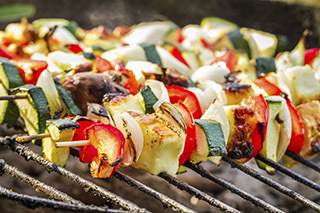 Whether you’re hosting a tailgate, packing a cooler or just having a few friends over to watch the game, try these healthy tips to tackle game-day overindulgences. Don’t wait until the last minute to plan your food! This leads to impulse choices that may not be the healthiest. Plan a balanced menu that includes all the food groups. You don’t want to get stuck with just burgers on the grill, buns and chips – and if you’re lucky, maybe a pickle and onions! Don’t skip breakfast and dinner to allow for one big game-time meal. This can lead to overeating and is also not beneficial for our blood sugars, energy level or satiety. Start your day off with a healthy breakfast and allow snacks to keep you going and to fight off hunger – which is typically when we find our hand in the chip bag! Tailgates can include a wide variety of adult beverages and soda. Bring water, coconut water or infused water with you, especially early in the season when it’s hot! This keeps you hydrated and less tempted to indulge in caloric beverages. These empty calories can add up quick! Also drink alcohol in moderation – that is 2 drinks/day for men and 1 drink/day for women. Put a healthy twist on traditional favorites. You don’t have to give up all of your game-day favorites. Just aim for one healthy substitution. Maybe it’s making salsa instead of nacho cheese for your tortilla chips. Or put turkey burgers and veggies on the grill instead of only brats and hot dogs. You will leave feeling like a winner no matter how your team did! Tailgating doesn’t have to always be about the food, it’s also about enjoying the company you are with. Start your own game of tag football, play corn hole, throw a Frisbee™, play with the little ones or simply go for a walk. This keeps you moving and is a great way to burn some extra calories! What’s just as much fun as going to a football game on a cool fall day? Joining your friends for a tailgating party. These pre-game events have become a pre-kickoff tradition. Here are a few key tips to keep your get-together safe. If possible, use two coolers – one for food and one for beverages. Food will stay colder because the food cooler won’t be opened as often as the one containing beverages. Food should be placed directly from refrigerator to cooler. Any perishable food should be placed in smaller containers. Raw meat needs to sit in the bottom of the cooler so any juice that potentially leaks will not contaminate other food. Always serve thoroughly cooked meat. Use an instant-read thermometer to take a temperature; don’t guess if it’s done. Pork, steak and fish need to reach a final internal temperature of 145° and ground beef and ground pork should reach 160°. For turkey or chicken, the ideal final temperature is 165°. Use clean serving plates and utensils, separate from the ones used while cooking. Food needs to be consumed within two hours after cooking, but within one hour if the outside temperature is above 90°. Cold food needs to be kept cold; hot food hot. It is important to keep cold food at 41° or below and hot food at 140° or above to prevent microorganisms from growing. This simple procedure is imperative to serving food safely. The most important step in preventing food-borne illness is to wash your hands throughout the tailgating event. Remember to wash hands before and after handling food, and wash especially well after touching raw meats and trash.